Stonehaven Florists offer a large selection of hand tied bouquets with variations in colour, size, style and flowers of course. 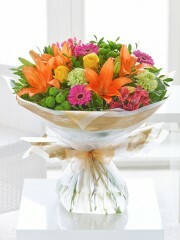 We have everything from mixed hand tided bouquets to more simple hand tied with just one or two types of flowers. Out range in values means we have something to suit all occasions. With hand tied bouquets no two are the same, each are individually arranged on a made to order basis so they are completely personal and unique. Our talented and artistic florist each have their own method of arranging the flowers so a personal touch is added by our team of florists at Stonehaven flowers. We take pride in the freshness and high quality of our flowers, after hand tiying your flowers we will gift wrap them so they look beautiful for the person they are going to, then we will add your personal message to a small card and then the final step is to deliver the flowers personally. 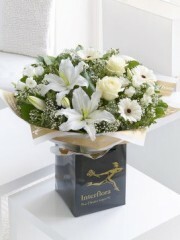 Our Stonehaven florist offer many delivery options so there is sure to be something that suits. 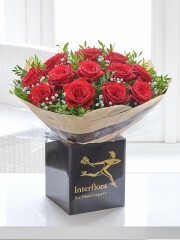 From our standard delivery which is Monday to Saturday on any day of your choice, including the next day. 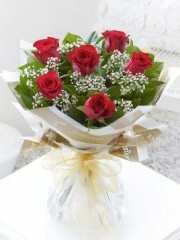 Or we offer a special same day delivery option for your flowers too. We offer a range of gifts that can be sent along with your flowers including balloons, wines, chocolates, champagnes to spoil someone properly!